This is Tanna's left hind hoof. 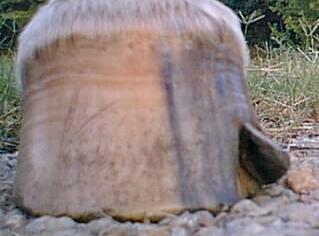 As you can kinda see, there is a chunk coming off the hoof. I have my farrier coming out Monday. He couldn't come any earlier than that. The top of the chunk is where an old cornet band injury was growing out. This probably would have been ok if he'd been shod, but combined with the dry, hard ground, flies and barefoot, that part of his hoof wall just weakened enough to crack. I'm unsure whether to go ahead and use my nippers and get rid of the hanging chunk or just leave it be until my farrier gets here. Tanna's not lame a bit. He doesn't seem to mind at all. He went flying around the pasture at a dead run when I got home from work, so he isn't bothered by it. So that's good. I'll have to wait and see if Billy can get a shoe on or if he recommends leaving him barefoot for longer for that to grow out. Or maybe he'll use some sort of hoof reconstructor to patch that hole. Who knows?